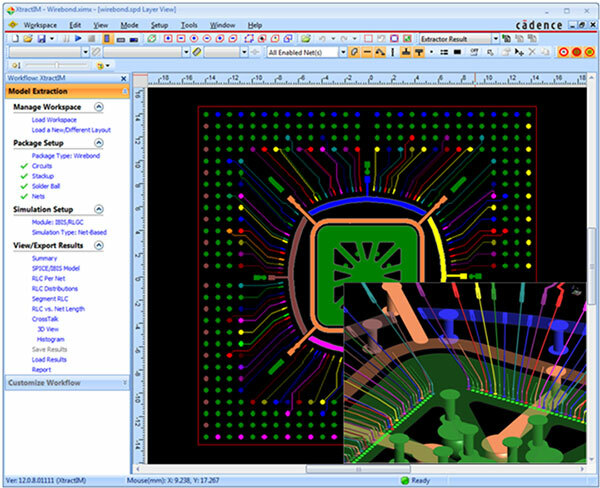 To help you create accurate, RLC, IBIS or SPICE IC package electrical models up to 10 times faster than alternative approaches, Cadence® Sigrity™ XtractIM™ technology uses hybrid solvers. With these hybrid-solver-derived models you can perform system-level signal and power integrity simulations by including drivers, receivers, and other interconnects. An option to generate broadband-optimized models is included. Sigrity XtractIM technology gives you electrical models of IC packages in IBIS or SPICE circuit netlist format. These concise parasitic models can be per pin/net RLC list, coupled matrices, or Pi/T SPICE sub-circuits. The technology’s broadband-optimized multi-stage models mean you can verify its accuracy over a specific frequency range and fill a gap between IBIS/RLGC and full-wave S-parameters. Whether you’re a casual or frequent user, the tool is readily accessible with an easy-to-use workflow helps you set up tasks such as stackup checking, C4 bump and solder ball creation, and signal and power/ground net selection, as well as defining other extraction parameters.